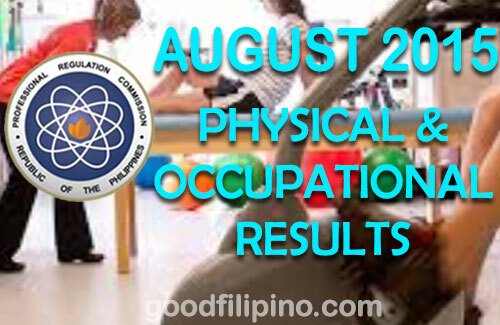 The Professional Regulation Commission or PRC announces the official results of the August 2015 Physical Therapist and Occupational Therapist board exam. The commission administered this PT & OT board exam on August 8 & 9, 2015 in cities of Manila and Cebu. The professional members of the Board of the Physical and Occupational Therapy who conducted the said exam are the following; Pollyana G. Escano, Chairman; Raul G. Agustin, Bernadette M. Reyes, Delia R. Pabalan and Rolland Lyle D. Duque, Members. In tradition, the commission conducted the PT & OT board exam twice a year. Last February 2015, there are 412 passers of Physical Therapist and 54 for the Occupational Therapist. Aside from the full list of passers, PRC also releases the list of topnotchers and the school performances. PRC usually releases the exam results in three (3) working days from the last day of examinations. PRC will be announced later the date and venue for the oathtaking ceremony of the new successful examinees in the Physical Therapist and Occupational Therapist board exams. PRC announces that 550 out of 868 passed the Physical Therapist Licensure Examination and 107 out of 170 passed the Occupational Therapist Licensure Examination given by the Board of Physical and Occupational Therapy in the cities of Manila and Cebu this August 2015. Comments or suggestions about "August 2015 Physical Therapists & Occupational Therapists PRC Exam Results (August 2015)" is important to us, you may share it by using the comment box below.